Introduced in 1978, the Christiania Bike has revolutionised family transport in Copenhagen. 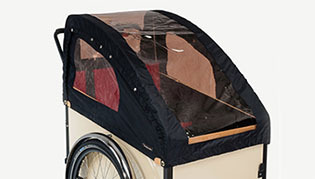 A quarter of families with two or more children own a cargo bike. It is now exported worldwide in a variety of forms. 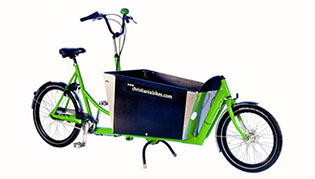 The Christiania Bike is not limited to just the transport of children, there are a wide range of both three and two wheeled options, configurations and accessories which allow the user to tailor the bike to their own requirements either for pleasure or business. The first Christiania tricycle in London was purchased by Trerence Conran for home deliveries from his flagship grocery store Bluebird. The Danish Design Centre has awarded christiania bikes® its 2010/11 Classic Design Prize. Here at Crown Cycles we can review your needs and tailor the Christiania Bike to your requirements. In addition, we are able to install the Pendix drive system on the Christiania Bike to waft you up difficult hills and terrain. Call to make an appointment to test ride our demonstrator. The full range of bikes can be seen on-line at the chiristiania bikes website.